As we started out, it was cold and the sun hadn't hit us yet, but the hiking warmed us up quickly. The trail we had chosen is the most popular and safest winter route up Mount Washington. The Lion Head trail has a seperate winter route that avoids the worst of the summer route avalache danger. Last year heavy rains washed out the summer route and a new winter route has been opened. The trip starts out on the Tuckerman Ravine trail, which is groomed by the snow cat and makes for fast travel. After about 45 minutes we were hiking in the sun and getting views of the terrain to come. Things had warmed up a bit and we had taken off some layers. The new winter Lion Head route starts on the Huntington Fire Road, where we put on crampons. We ran into some climbers who were staying at the Harvard Cabin and they seemed a little depressed to be headed out on such a fine day. After a short, flat section, the winter Lion Head route starts to climb in a big way. There were some sections that required front-pointing, and made me wonder about the trip back down. Very soon, we began getting views to the east, of the Carters and Wildcat range. At one point we got a good view of the Harvard Cabin and the Huntington Ravine Fire road. The weather was perfect for our hike, sunny and warm. From here on up, there were views everywhere you looked. Around 10:30 we reached the Alpine Zone sign and took a rest with water and gorp. We started getting clear views of the summit cone and across Tuckerman Ravine towards Boott Spur. Kathy noticed a lone hiker below us, who was catching up. All along the hike we had seen the tracks of two more people ahead of us but we never caught sight of them. In about 30 minutes from treeline we got to the top of Lion Head, a rocky outcropping on the right side of Tuckerman Ravine. Last year, someone fell to their death from this spot while chasing their sunglasses too close to the edge. The views of Hillman's Highway and Tuckerman Ravine took my breath away. I'd seen pictures of the ravine like this, but this was different. Everything was crystal clear, still, and quiet. The hiker we had seen below us caught up to us on Lion Head. His name was Bill, and, yes he was solo hiking. We all thought it was a good idea to join forces for the rest of the journey. Since we now had an extra set of hands, we took a picture of Kathy and I on the top of Lion Head. The trail has a flat section, then after the Alpine Garden trail junction begins to climb a snowfield. 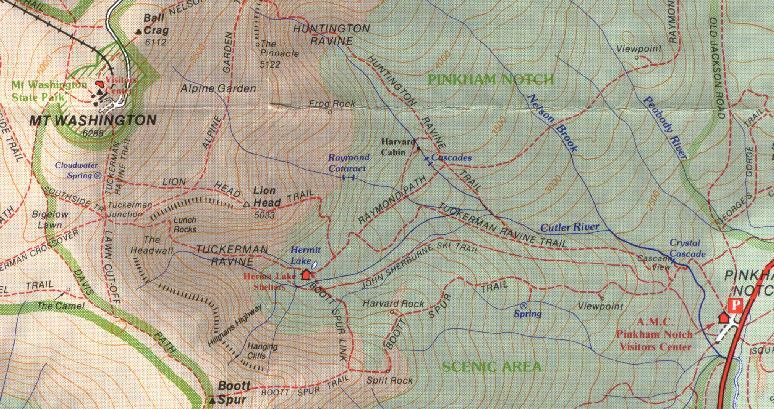 This climb bought us views of the area above Tuckerman Ravine, a view that makes you wonder about Tony Matts, who schussed the headwall during the 1937 Inferno Race. One more photo stop and we were at the summit! The view of Boott Spur looked like arctic tundra. I took one photo of Kathy and Bill at the trail sign to use up my last shot and then changed film.